An archaeologist digging in the rubble of a distant past counts on the conqueror’s havoc, nature’s upheavals and plain human negligence to have left legacies of unintended value — like a fragment of a clay tablet bearing archaic writing from an early period of state formation in Greece, more than 3,400 years ago. Had it not been for some inadvertence, the tablet would almost certainly have disintegrated in the rain in a year or two and scattered with the wind as so much illiterate dust. The tablet seems to be a “page” from a bookkeeper’s note pad. Not meant to be saved as a permanent record, it was not baked in a kiln , but ended up in a refuse dump, where a fire hardened the clay for posterity. The discoverers and other specialists in Greek history said the tablet, one of the oldest known examples of writing in mainland Europe, should cast light on the political structure and bureaucratic practices near the beginning of the renowned Mycenaean period, 1600 to 1100 B.C. At its height, the culture supported the splendor of palaces at Mycenae and Pylos and inspired the heroic legend of the Trojan War, immortalized in Homer’s Iliad. “This is a rare case where archaeology meets ancient texts and Greek myths,” Michael B. Cosmopoulos, director of the excavations, said last week in announcing the discovery. Dr. Cosmopoulos, an archaeologist and professor of Greek studies at the University of Missouri, St. Louis, said the tablet, only 2 inches by 3 inches, was a surprise uncovered last summer in the middle of an olive grove in southwest Greece, near the modern village of Iklaina. Judging by pottery in the dump, the tablet dates to sometime from 1490 to 1390 B.C. Scholars said they had little evidence before that clay tablets were made and used to keep state records so early in Mycenaean history. Elsewhere, the Minoans on the island of Crete were keeping records as early as 1800 B.C. 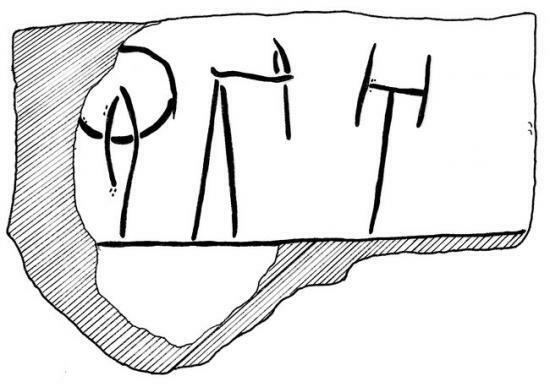 in an enigmatic script that predates the Mycenaean Linear B. The earliest known writing, also presumably for bookkeeping, evolved around 3200 B.C. in the Sumerian city of Uruk, in Mesopotamia. The first Egyptian writing appeared more or less at the same time. The Missouri team had investigated the Iklaina site for 11 years, and in the last couple of summers examined the extensive evidence of stone walls of what may have been a palace at a district capital. Some walls are decorated with frescoes showing ladies of the court and ships with dolphins cavorting in water. There are also remains of a drainage and sewer system far ahead of its time. 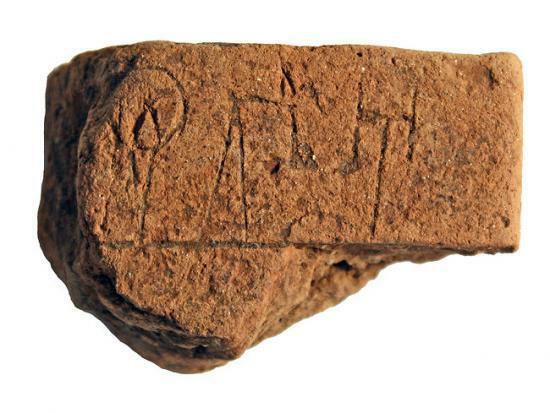 Previous excavations had yielded clay writing tablets from 1200 B.C., close to the approximate time of the supposed Trojan War, and some references to Iklaina as an administrative center associated with Pylos. Dr. Cosmopoulos said in an interview that the new findings appeared to show that some 200 years earlier this may have been the seat of an independent chiefdom that had already achieved a degree of literacy and political organization. On one side, the tablet has one readable word, a verb meaning to prepare to manufacture. Along the broken edges are other characters, but not enough for scholars to make out the word or words. On the reverse side, the tablet gives a list of men’s names alongside numbers. Cynthia Shelmerdine at the University of Texas, Austin, was the first to read the writing and assess its importance. Archaeologists are only beginning to consider the implications of the discovery. It suggests that political states in ancient Greece originated at least a century and a half earlier than had been documented. Iklaina may have started small and been conquered and annexed by one of the expanding powers, like Pylos, in the same region. Dr. Cosmopoulos suggested the Iklaina palace may have been a district administrative center subject to one of the main capitals: “a two-tiered government, or a sort of quasi-federal system,” he called it.